It is rare to get a glimpse into the minds of North Park builders from before the 1930s. They and most of their children have passed on, leaving unlabeled photographs and bits of paperwork to be puzzled over by grandchildren and distant relatives. 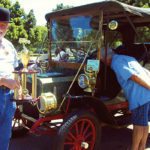 Recently the North Park Historical Society (NPHS) had the good fortune of connecting with descendants of Pear Pearson, one of San Diego’s premier builders from the early 1920s. 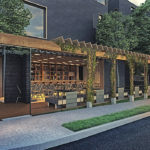 Through their family records we have gained valuable insights into how he conducted an exemplary career in commercial and residential construction. Pear Pearson built this house at 3351 Thorn St. in North Park in 1926. 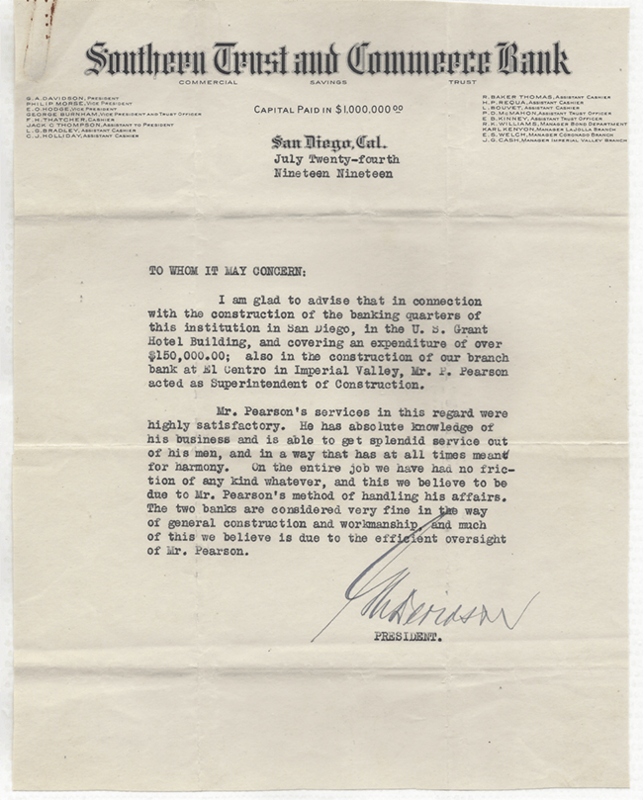 Pearson was an early North Park resident who has been recognized by the city of San Diego as a master builder. He was born Per Olsson in Sweden in 1887 and changed his name upon arrival in the United States in 1905. He lived in Denver, Colorado, where he was a cabinetmaker and contractor. He later moved to Berkeley, California and was responsible for many bank remodels in association with San Francisco architect H. H. Winner. 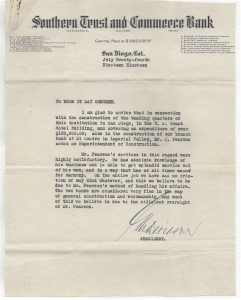 Perhaps attracted by the building boom stimulated by the 1915 Exposition, Pearson began building homes in San Diego in the early 1920s. One of his first homes was 3602 Villa Terrace, which he built in 1921 for Fredrick and Ada Sedgwick. This wood-sided Craftsman home with tall, square porch columns has been designated as a significant historical resource by the city. In 1922, Pearson built a home at 3636 Villa Terrace, where he lived with his wife Helen and daughter Vernette for several years. 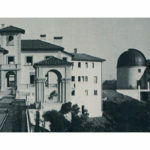 In 1925, he built a Spanish Revival bungalow at 2536 San Marcos Ave. in what is now the Burlingame Historic District. The family lived there until 1936, when they moved to a house on Herman Avenue and later to Boundary Street before settling in La Mesa in the 1970s. He died in 1973 at age 86. 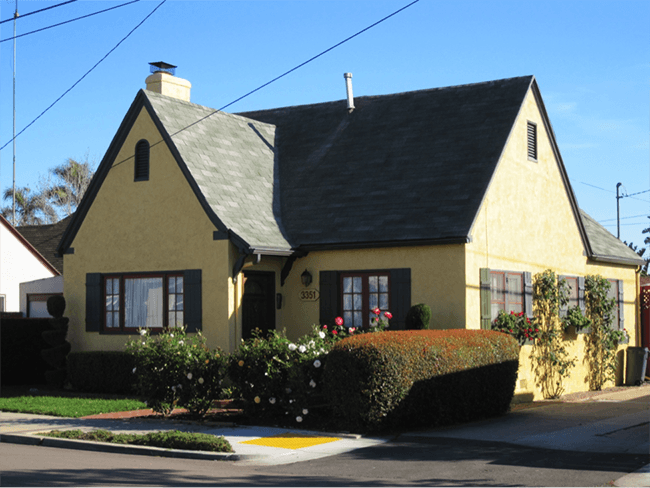 Although Pearson typically built in the Craftsman or Spanish Revival/Mission Revival style, several of his homes uniquely reflect his Swedish roots, particularly the charming bungalows at 2624 San Marcos Ave. built in 1925, and 3351 Thorn St. built in 1926. He had a long career building high-quality homes throughout the San Diego region, including in North Park, Loma Portal, Mission Hills and La Mesa. 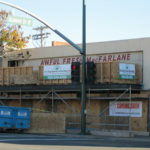 He also was responsible for commercial buildings, notably the large brick and concrete store at 1007 University Ave. in Hillcrest currently housing Ace Hardware, built for $30,000 in 1926. The businesses at this location in the 1927 city directory are listed as University Avenue Furniture Co. and University Window Shade Co., at 1003 and 1009 University Ave., respectively. One of the keys to Pearson’s success was always doing high-quality work. Letters of recommendation saved by the family attest to his knowledge and supervisory skills. One letter, dated 1919, is from prominent San Diegan G.A. Davidson, president of the Southern Trust and Commerce Bank, complimenting Pearson on supervising construction of their banking quarters in the U.S. Grant Hotel. G. Aubrey Davidson was founder of the bank, president of the Chamber of Commerce, and is known as the father of the 1915-16 Panama-California Exposition because the idea for the Exposition began with him. Pearson was still using G. Aubrey Davidson as a reference in 1943 when applying for federal construction work. 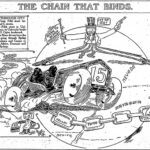 Another key to success was Pearson’s organization and careful tracking of expenses. A ledger book saved by the family presents meticulous notes on prices of various materials and labor. Costs are recorded for 17 houses, including his own home on San Marcos Avenue in Burlingame. Items listed for a large Spanish Colonial Revival home Pearson built for his friend Leo Hoffman at 2704 Teresita St. in 1928 range from nearly $800 for carpenter labor, $535 for lumber, and $400 for millwork sash and doors to $6 for a folding ironing board. The ledger is also an interesting source for names of specialty contractors of the time. The log for 2536 San Marcos Ave. includes Fred A. Heilbron Plumbing, Benton Roof Co. and Fred Cottrell Plastering. A favored source of hardware was Berger Hardware, a store still operating in North Park after more than 100 years. 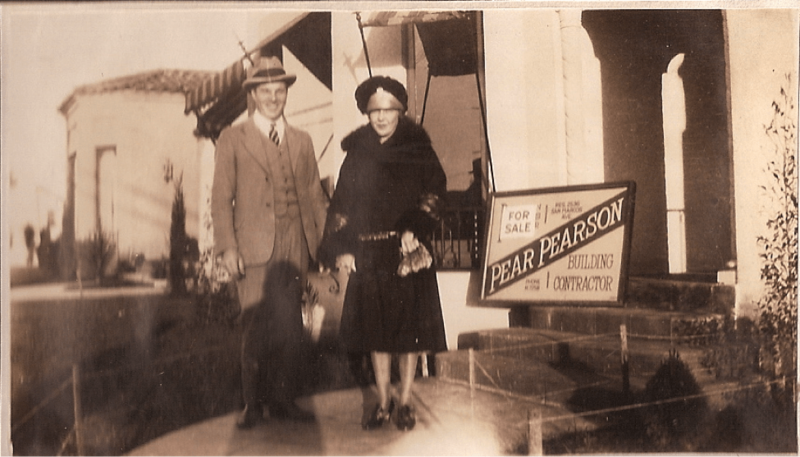 NPHS is indebted to the grandchildren of master builder Pear Pearson for sharing their family photographs and records. We invite anyone with an interesting North Park ancestor or historical story to contact us at info@northparkhistory.org. For an outdoor lecture about many other early North Park builders, join our docents for a guided walking tour of the Dryden Historic District on July 11, 2015 at 9 a.m. Visit our website at northparkhistory.org for more information. Thank you so much to Katherine Hon and the UpTown News for the wonderful research and articles of our Great Uncle, John Pearson, and our Grandfather, Pear Pearson. 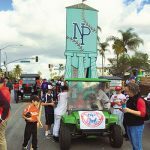 How exciting it is to see them brought back to life for a bit, and to relive their history and contributions to the North Park community and San Diego. They live on in the many fine buildings they constructed in many corners of San Diego. We are grateful to Katherine for the many hours of research and the crafting of the fine articles about the Pearson brothers. What a great story. I enjoyed learning about the origins of the beautiful homes in my neighborhood and plan to walk the ‘hood to check them out. Thanks to the family for saving all Pear’s documents.